Turn bulletin boards into a ministry opportunity. Professional and volunteer teachers appreciate time-saving, creative ideas for the classroom. This revised, reproducible teacher resource, offers 20 favorite designs--more than enough for every month in the school year--to help reinforce the season and a selected Scripture. The book also includes simple directions, basic designs, themes, optional lettering designs, shapes, borders, explanations, and color and material suggestions. Children learn, grow, and gain inspiration daily when these bulletin board designs decorate school halls and classrooms. 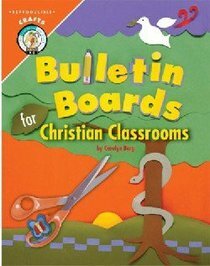 About "Bulletin Boards For Christian Classrooms"